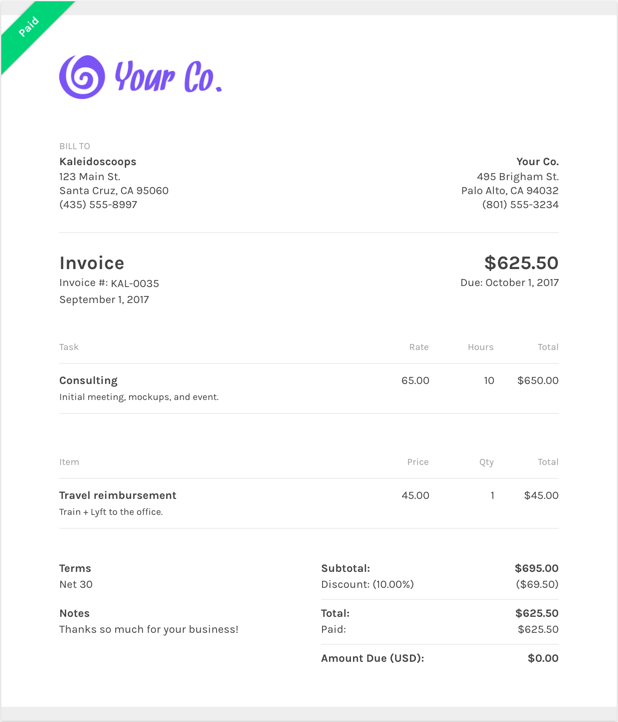 Looking for freelancer invoice templates? We've got you covered! Do I need more than just a freelancers invoice template? Freelancers of all types use ZipBooks for their freelancer invoice template needs. You're going to love our templates because, as a freelancer, you know how important it is to get paid quickly so you can move onto your next problem. That's where we come in. We coach you on what you need to include in the invoice to get paid faster. An awesome thing about ZipBooks is that you can save default settings (like your notes and payment terms for your invoices) once you nail down the invoice details. Using ZipBooks for your freelancer invoice never forgetting to include critical information. We’ve collected data from tens of thousands of invoices and use it to score your invoice based on what information you include so you’ll get you paid faster. Why should I use ZipBooks’ freelancer invoice template to create and send my freelancer invoice?